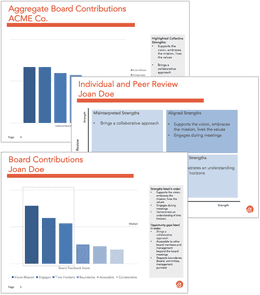 Board members share feedback and improve their performance, supported by an objective, confidential, and non-confrontational process. Board membership is a team sport—success requires each member, individually, and the whole team, collectively, to work toward common goals. For a lasting spike in performance, many boards take time to evaluate and develop individual players and the teamwork itself. This is done through a peer review that gives members an opportunity to reflect on their own contributions as well as that of their colleagues, then offers constructive analysis of the resulting information. 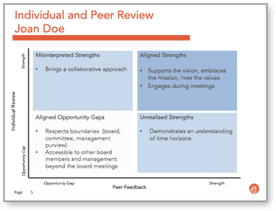 Our Board Peer Review injects objectivity into this process, creating a team-focused feedback loop that encourages personal development in a “safe” and unbiased manner. 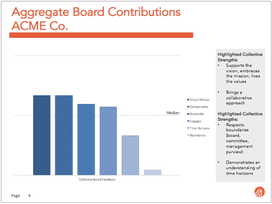 Relying on confidential and non-comparative techniques, this assessment highlights the collective strengths and board development opportunities for the whole group, while separately providing individual members with confidential feedback that underscores the contributions they are valued for and the areas they might want to develop. 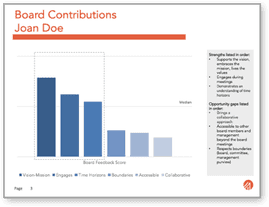 A board’s commitment to Board Peer Review underscores the importance of professional development within the organization.